Poe was an American writer in the early 1800s. He was mostly a writer of short stories and poetry, and mostly about mystery, melancholy and darkness. Such is the tragedy of many great writers: he is appreciated more in death than he was in life and he’s now retrospectively credited with inventing detective fiction. Poe’s life was difficult. he suffered poverty and the deaths of loved ones. The loss of his paramours is a recurring theme in his poetry. Something that stood out to me while reading Poe’s poems was the obvious themes of loss and melancholy. Death and darkness show up constantly, many of which are laments for things that Poe has lost. The best of these is The Raven, possibly Poe’s most famous poem. Many of the poems are heart-breaking, and if you’re paying attention, you can get a glimpse of the tragedies that shaped Poe’s life. But not all of Poe’s poems are quite so tragic. There are others that carry themes of fantasy and dreams, of castles by the sea, of journeys or adventures. But storytelling isn’t a strong point of Poe’s poetry. The foreword notes that Poe favours lyricism and euphony over substance, and this is noticeable in many of Poe’s lesser known poems (one for example is about a lake. Just a lake). When he does try to emphasize storytelling, as in his longer poems, the results aren’t as memorable. 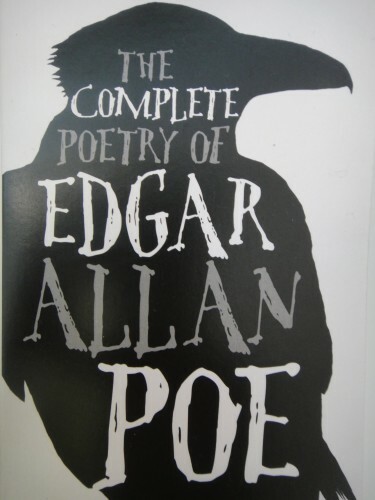 To his credit, Poe’s lyricism is excellent. His poems have mesmeric rhythms and many of them when read aloud have a hypnotic quality to them. Most notable among these is, once again, The Raven. I’d even call them musical and while many of them appear to mean little (e.g. The Bells… which is about bells), they sound beautiful. Quite expertly on his part, Poe also varies his rhyming structures, often many times within the same poem. If you’re paying attention, you can even see him interlacing multiple rhyming structures together at the same time. Incredible how he does it actually. It’s something that’s better seen than described, but with that many constraints on rhyme and rhythm it’s understandable why the storytelling isn’t often that striking. But where Poe does manage to combine powerful storytelling with his hypnotic lyricism, he’s at his strongest. This happens most often in his laments, when he’s mourning the loss of his young wife who died of tuberculosis. Annabel Lee, The Raven, Lenore; all of them seem to be expressions of despair at what he’s lost. It seems crass to say that out of his sadness he created something beautiful, so let me rather say that through his poetry we can come to understand his pain.